Do you immediately zone out when you hear things like “systems operations” and “process efficiency”? I know I used to. I’ll be the first to say that I didn’t always care about my business systems. As a matter of fact, those things repelled me. They’re not my zone of genius—and so I ignored them for a long time. 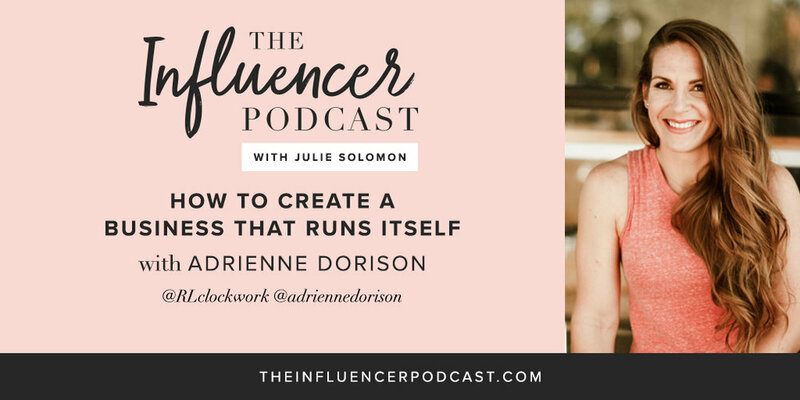 I didn’t even realize how much of a bottleneck I was causing in my business until I met today’s guest Adrienne Dorison last year. Adrienne came into my life and completely changed how I view and run my business. Her way of looking at your business as an assembly line is going to blow your mind. Adrienne and her business partner, Mike Michalowicz, have also created Run Like Clockwork, an operations consultancy that equips CEOs with the skills to design a business that—quite literally—runs itself. Today, Adrienne is sharing step-by-step strategies you can use to minimize unnecessary output, fulfill your highest value, and start experiencing your business as the CEO—even if you’re a one person show. You know I love to chat….especially with you! Snap a screenshot and tag me and @adriennedorison on Instagram as you’re listening to this week’s episode. And remember to hashtag #theinfluencerpodcast, that way I can share your screenshot on my story too!